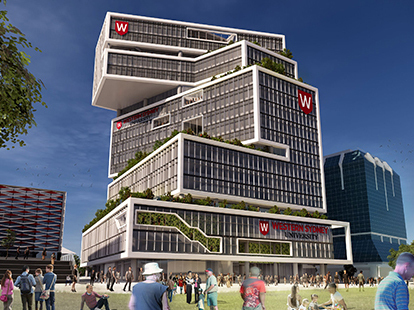 A concept design has been revealed for Western Sydney University (WSU)’s new vertical campus in Bankstown. The concept features a vertical stacked design with a glass façade and gardens interspersed throughout. The project is still pending planning approval, and a State Significant Development Application for the building is also in progress. Set to open in 2022, the campus is planned to revitalise the area’s CBD precinct, and embed the university in the economic, social and civic life of Bankstown. Located between Bankstown’s Council administration building, Library and Knowledge Centre, the campus will provide new jobs and educational opportunities within the heart of the community. A new university campus in the Bankstown CBD is an opportunity for western Sydney to increase tertiary education attainment, shape Bankstown into a 24-hour activity centre and support the knowledge and innovation economy, says Urbis, who will be responsible for town planning and community engagement in the project.